It’s no wonder that adverse drug interactions are so frequent, making prescription drug-related problems the sixth-leading cause of death worldwide. For more than a decade, Drs. Robyn Tamblyn and Allen Huang have been working to get the right data to doctors to help them make the best decisions for their patients. In 2003, with the support of McGill’s Office of Technology Transfer, the researchers created a company called MOXXI Medical to market an easy-to-use drug management system. The concept is simple. 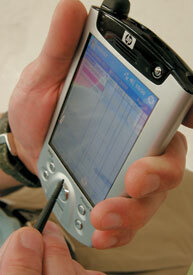 A physician prescribes a medication using a hand-held computer. A wireless connection with a central database displays the patient’s current prescriptions, provides information about the drug, identifies possible adverse reactions or other problems and suggests safer alternatives. This wireless capacity allows information to be exchanged and government alerts on drug safety to be displayed in real time. The doctor prints a hard copy of the e-prescription – eliminating illegible handwriting – which the patient takes to the pharmacy. To get rid of transcription errors, pharmacists participating in the MOXXI program can upload the electronic prescription directly into their management database. Information on any substitutions made at the pharmacy goes back to the physician, who can also check whether the patient has filled the prescription. One of their big breakthroughs was realizing that the data they needed already exist. Drug insurance companies in Quebec were gathering information on prescribed drugs as a by-product of paying pharmacies for medications dispensed. Because it was seen as administrative data for financial purposes, no one had thought to apply it to clinical care until Tamblyn and Huang came along. As logical as Tamblyn and Huang’s new system is, it still wasn’t easy to implement. Integration was difficult because of the many different stakeholders – insurance companies, pharmacies, government and physicians. “It took us forever to get all the players to play in the same sand pile, to have a common vision,” Tamblyn says. Led by Jacques Paquin, a former senior executive at Microcell Telecommunications, the company is now working to get the system used more widely. Tamblyn and Huang are already looking to future applications, such as helping physicians customize treatment based on a person’s genetic profile. The Canadian Health Infostructures Partnership Program of Health Canada funded the research leading to the creation of MOXXI Medical Inc. Start-up investment was provided by MSBi Capital, a seed and early-stage venture capital fund focusing on research at McGill, Sherbrooke and Bishop’s universities. ESI Canada, a health-claims management company, and DMR Canada, an IT solutions company, are investment partners in MOXXI.